MotoVida started out a few years back as a small shop and while they’ve grown since, they’re still only a team of five. 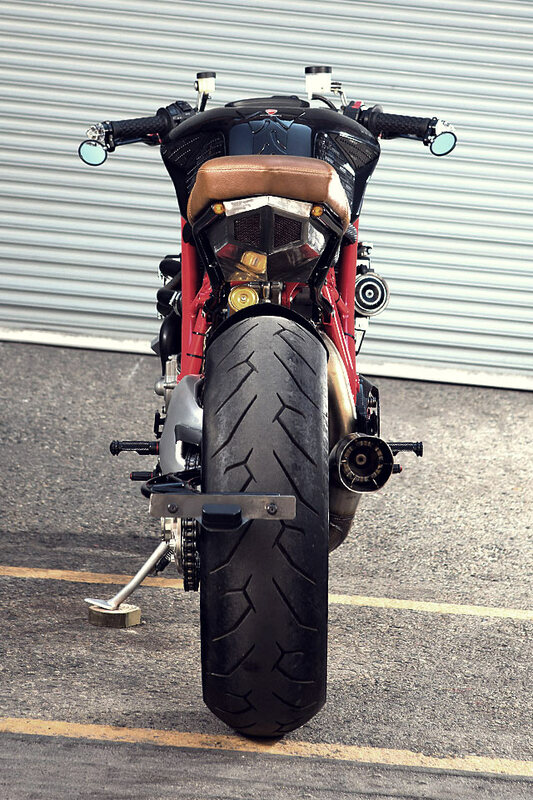 Clearly dedicated to the service, customs and restoration of pretty much all makes of bikes, they’ve recently added the Moto Guzzi and Aprilia notches to their belts. “We’ve built ourselves around a completely relaxed and inclusive riding community,” says the shop’s Brent Giesbrecht. “We place an emphasis on the fact that old or young, novice or veteran, it does not matter what you ride. Everyone is welcome”. Located in the heart of downtown Kelowna, British Colombia, they are lucky enough to have easy access to some of the country’s best riding roads and a climate that offers a lengthy riding season. And when it does snow, Whistler is only a half day‘s drive away. We could live with that. 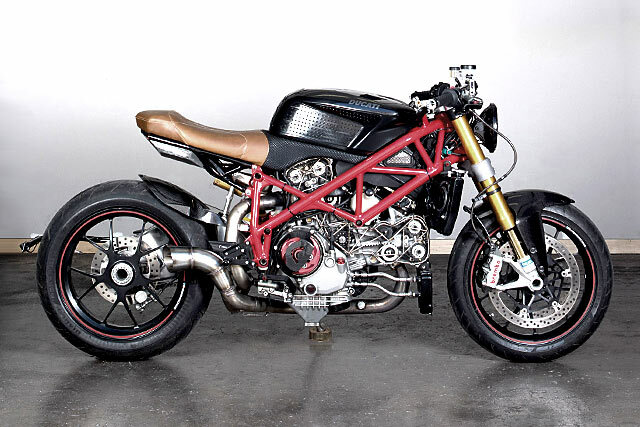 “The donor bike is a 2008 Ducati 1098S,” says Brent. “We call it the ‘Cage Fighter’ because it’s got some streetfighter styling with cages we used to cover the open belts”. The bike was brought in by the customer in perfect original condition with a request to turn it into a stripped down cafe fighter. 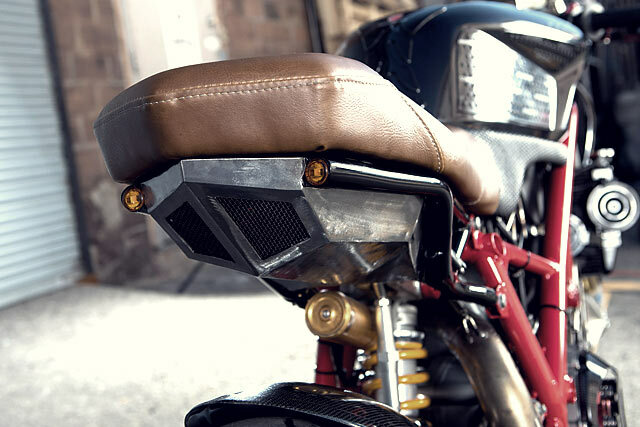 They knew he wanted a brown seat with some stitching, a shorter tail section and an industrial, gritty look. Apart from that, they were free to do pretty much whatever they wanted. “We decided to give it a raw, industrial feel by working with the angles and lines of the trellis frame. 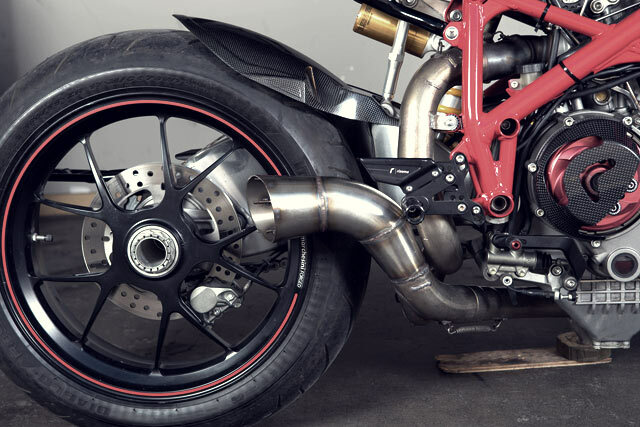 We also wanted to play the bare metal look against the carbon fiber accessories that were already on the bike”. 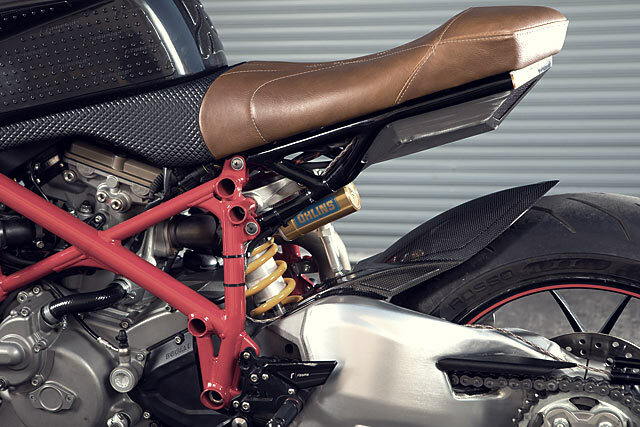 The soft lines of the swingarm were incorporated into the plate mount while carrying on the trellis theme. Once the lines were chosen, the engine was dropped, the bodywork’s mounting tabs were removed and the frame was completely re-painted. The subframe was then shortened and lowered slightly to follow the new line of the fuel tank. It now also houses a lithium battery and an LED tail light covered with a stainless screen. “Mini signal lights finish off the sub frame. 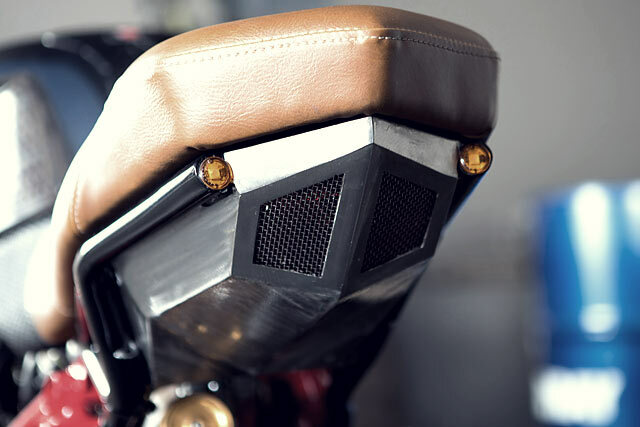 The seat and pan were made to lock into place without any fasteners as well as to cover the exposed area of the tank that would have normally been hidden by the fairing”. 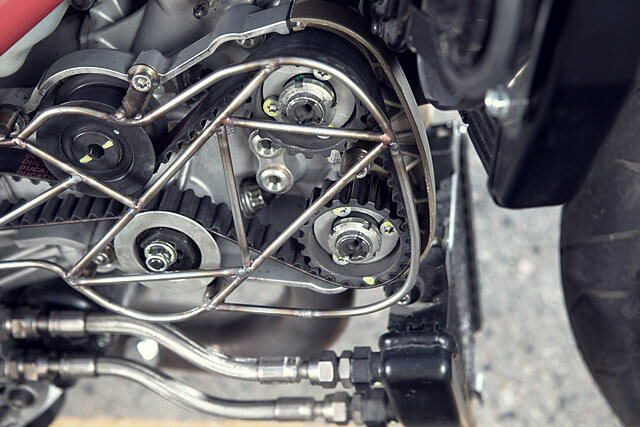 Brent says the biggest pain was cleaning up the Ducati’s side of the bike, as the factory-installed electrical harnesses and plumbing sit outside the frame. “With the battery relocated under the seat, we were able to move the remainder of the harnesses to inside the frame”. Another steel box was then built to house the ECU and regulator and was also finished with a stainless screen. “The plastic belt covers were binned in favor of cages made with stainless rod”. And with the love given to the left side of the bike, it became obvious that the right side was getting a little jealous. “The plastic belt covers were binned in favor of cages made with stainless rod. 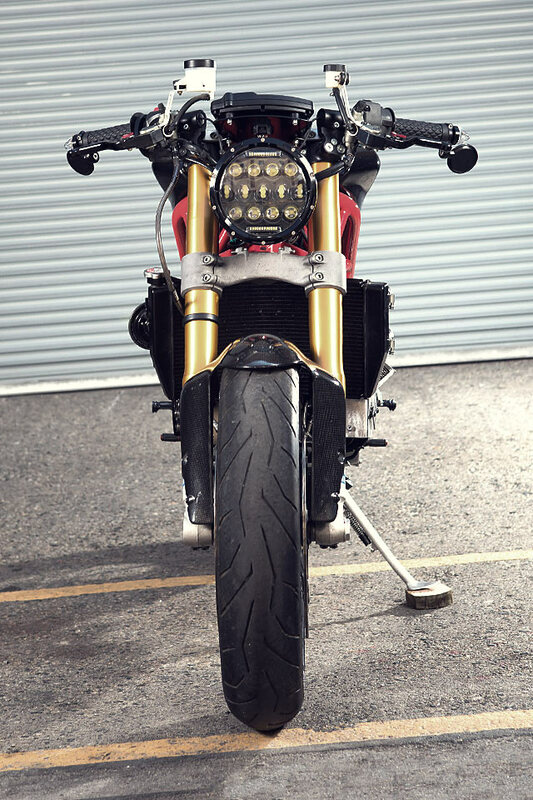 A single LED headlamp, minus any housing, lights the way while the slightly taller than stock Woodcraft clip-ons carry CRG mirrors and Motogadget bar end signals”. 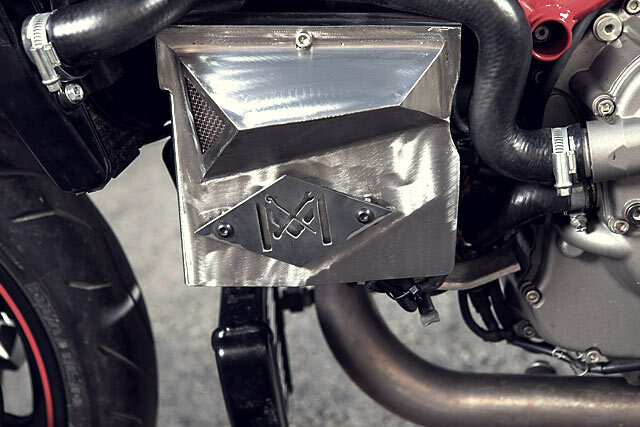 The exhaust is a stock 1098 header system, but with a custom stainless megaphone. 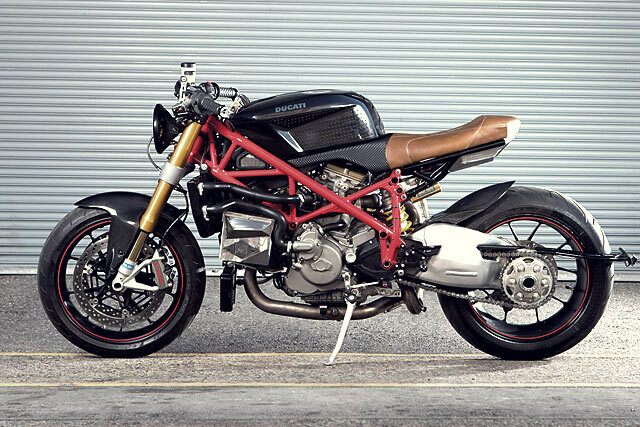 All up, it’s a Ducati that looks like it’d give as good as it gets. With the stock 1098 putting out around 140hp at the rear wheels and MotoVida’s no-holds-barred ‘making weight’ regime, we’re guessing the end result that would be a bike that’d be ready to take a stock 1199 into the tenth round.